Tyler was raised in Wamego Kansas where he developed a knack for working with his hands. 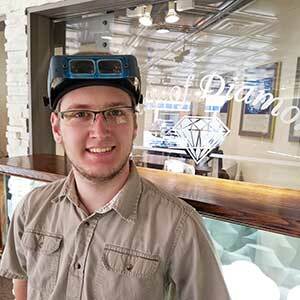 Deciding to pursue a career in the jewelry industry, Tyler journeyed to Paris Texas to attend the highly regarded Texas Institute of Jewelry Technology. During his two year certificate program, he honed his skills and craft and graduated in 2016 with the Stuller Platinum Award of Excellence. Recommended by his professor, Tyler joined the staff here at House of Diamonds where he continues to improve his craft. When Tyler isn’t practicing his skills, he enjoys collecting books and making model ships. So, so very proud of you Tyler. You’re a wonderful man and will go far with your business now! Congratulations!! Don’t Wear Your Jewelry In the Ocean!